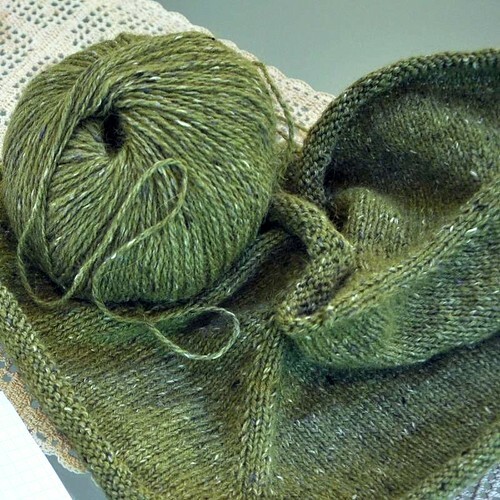 At the time, feeling grumpy about it, and without bothering to sew on the sleeves, I shoved the unfinished cardigan into a bag and moved onto the next project. But it’s spring again, and my flowery frocks have come out of winter storage, and I have been hankering after something pretty to wear over them. I remembered this cardigan, and wondered if I could do something to improve it. I’m not totally sure about this. The original edging is so pretty that it seems a shame to lose it. The next thing I’m going to try is just to re-do the cast off on the buttonband more loosely, and see if that makes a difference. I really hope I can salvage this cardigan; it is too cute to give up on completely. 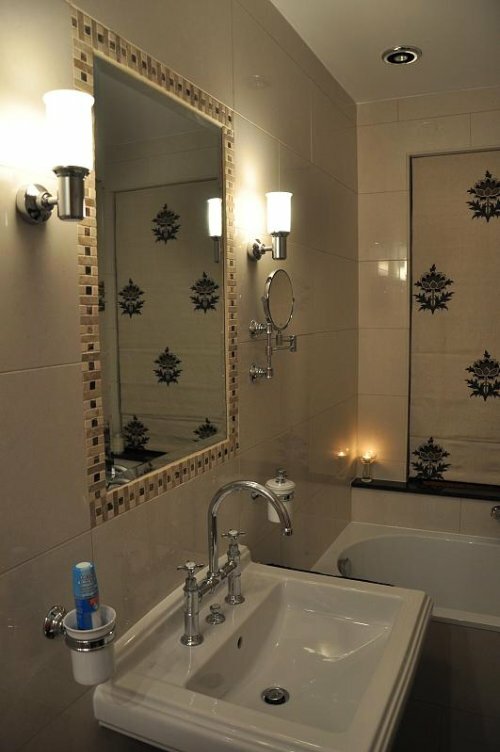 … of our new bathroom. 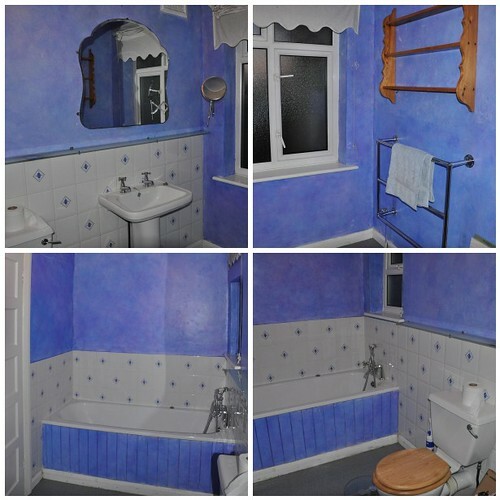 I quite liked how this room looked, with the pretty blue and white tiles and the blue scumble painted walls that I had done. 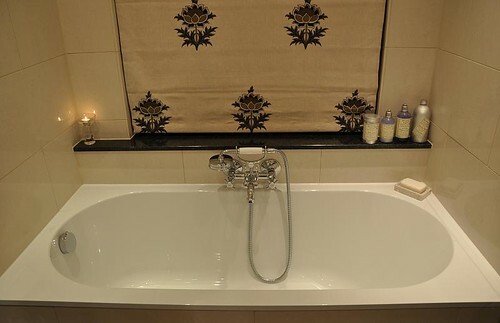 The problem with it was that nothing really worked: the basin and bath taps provided merely the faintest dribbles of water, and by the time the (incredibly shallow) bath was full, the water would already be getting cold. So, after fifteen years of living with it, we finally had had enough. 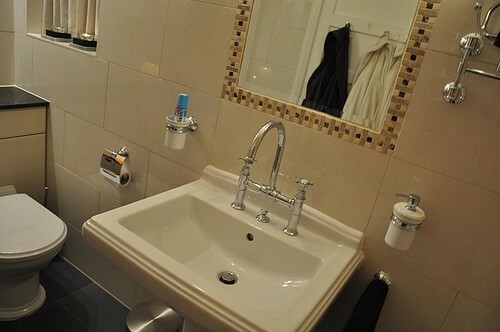 Without further ado, I would like to introduce you to Our New Bathroom! The room is pretty small, it’s about fifteen feet long and six feet wide, which is just long enough to squeeze a (not very long, but very very deep) bath into. The result has been fantastic. 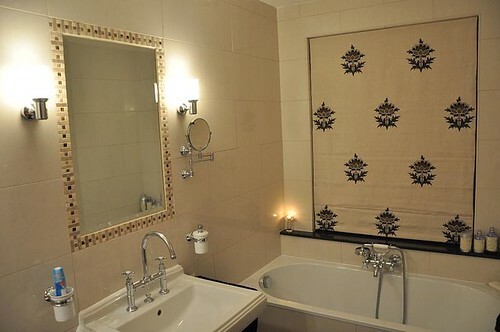 Not just how the room looks, which is a lovely improvement over how it was, but in terms of its functionality. It actually feels as though we have gained a whole extra room in our house. Our house was built in the 1920s, and I was keen to give the room something of an early Art Deco feel. 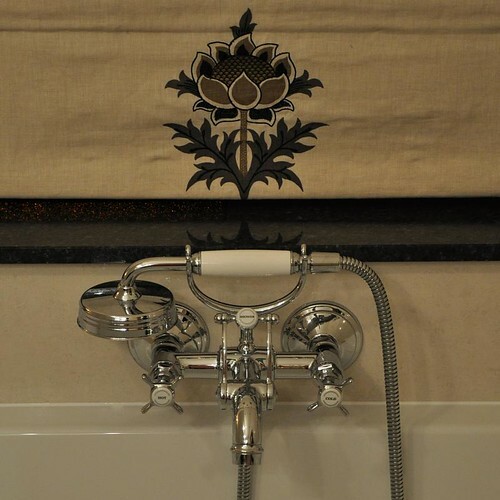 The fabric on the blind is a William Morris pattern, and the taps are copied from a turn of the century original. I love the taps! On the wall opposite the bath are cupboards. This end of the room is where functionality was more important than aesthetics. The top cupboards contain all of our potions and lotions, as well as the electric toothbrush. The bottom cupboards are actually laundry bins that pull out. Because there are three of them we can now sort laundry as it goes into the bins. The wire baskets inside them pull out and can be taken straight to the washing machine. It’s a genius detail that I love! I also really like having these sculptures to look at when I’m lying in the bath. 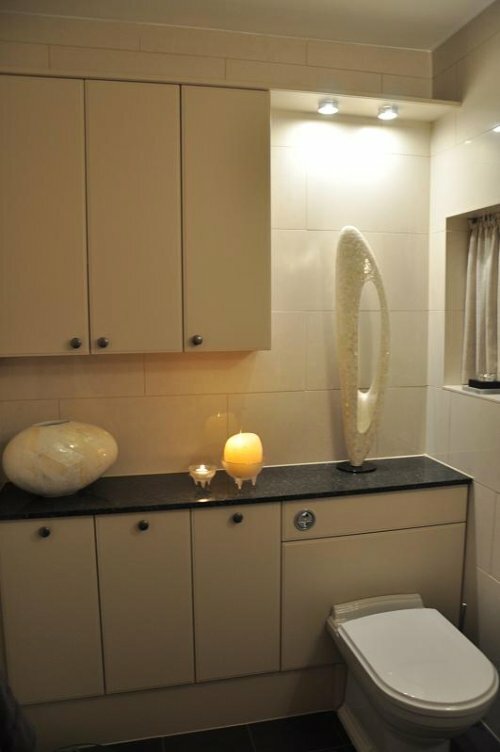 I also really like that there is no shelf or mirrored cupboard above the sink. All the ones I saw looked too modern; I liked the simplicity of a bevel-edged mirror with wall lights on either side of it. I’m so happy with this new room! First of all, I’d like to thank you for your comments on my previous post. I feel pretty humbled by how many of you (almost) told me to get over myself! No, I know, none of you actually said that, you were all much too kind and tactful (and I thank you for that!). But, after reading your comments, I got the (luckily as yet unfrogged) cardigan out again and had a good look at it and, you know what? You were right. It really isn’t that bad at all. I will keep it as it is for now, and may well go back and finish it after the current version is done. Today’s post is a salutary lesson about READING THE PATTERN! 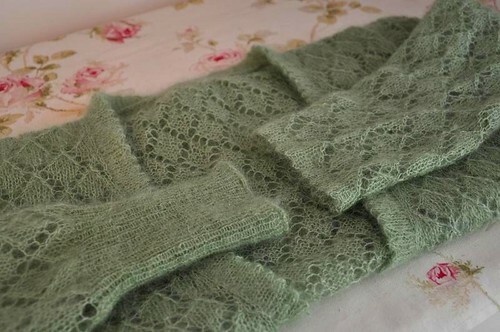 I have been happily knitting away on my Hedera socks when I am on the train, and almost finished the first sock. 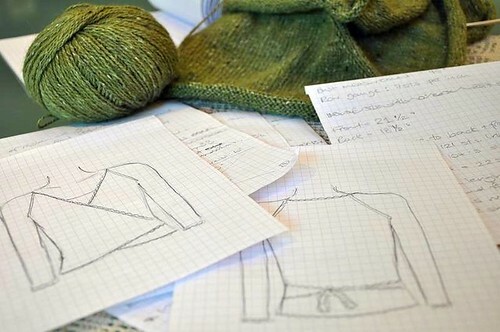 As I’m sure many of you know, it is a lovely pattern to work on, not too complicated, yet not too boring. And I am loving the Sundara yarn that I’m using. And the mistake? 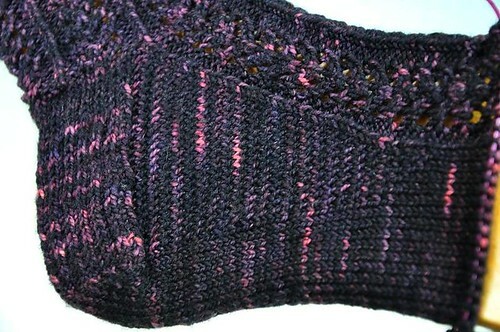 Well, after knitting the heel, the pattern requires you to pick up 25 stitches on each side to form the gusset. 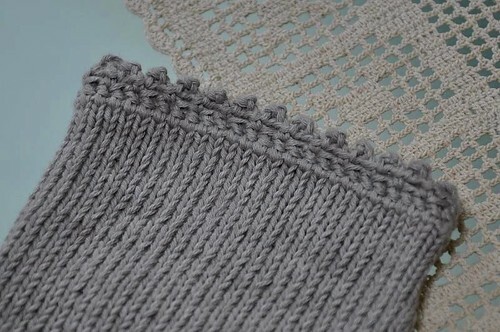 You knit the first row after that into the back of the stitch, to avoid making holes. After that, each row is supposed to be knit normally. 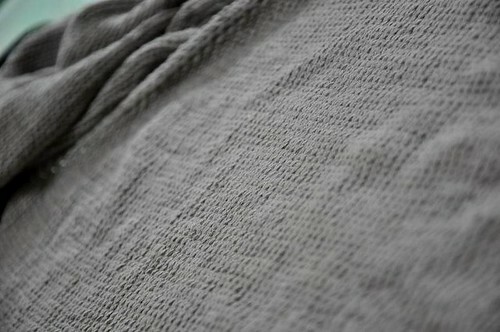 Instead, I continued to knit every other row with the stitches twisted. I did actually like it, so decided to keep going with it for a while. The stitch pattern turned out to look really pretty with the variegated yarn. But when I got to the end of the gusset decreases, I didn’t like how the stocking stitch and the twisted stitch parts joined together. 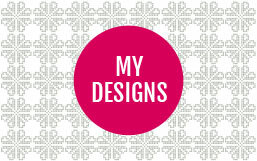 I know that this will not show when I’m wearing them but, for me, that isn’t really the point. I don’t just knit things to wear, I like taking the time to do and redo if necessary, and to get things just how I want them. This is really the one area of my life where I allow my perfectionist tendencies full rein, and doing so makes me happy. I thought it was nice enough to frog the first sock and re-knit it. So I am. When I started thinking about my yoga wrap cardigan, I imagined it in a cotton yarn that I could wear in classes all year round. 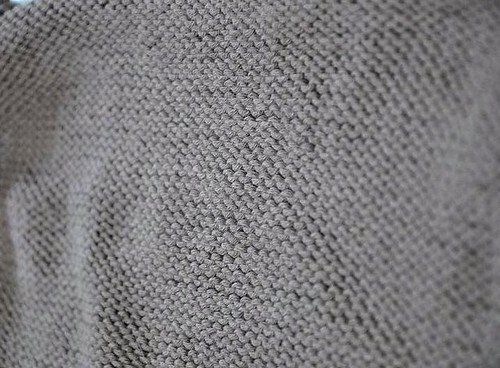 Browsing in John Lewis, I saw a child’s sweater made up in Rowan Purelife Organic Cotton DK, and it was gorgeously soft and drapey. So, in a classic case of optimism winning out over realism, I bought some and started knitting. Why optimism over realism? Well, stocking stitch and me have had some unhappy interactions in the past. I know that I struggle to get even tension and that my knit stitches tend to be looser than my purl stitches. I know that inelasatic yarns such as cotton are likely to exacerbate this problem. But, seduced by the lovely sample in the shop, the soft colours and the softer yarn, I nevertheless went ahead and cast on. I completed the yoke and both arms before deciding that I could not go on any further. The sleeves, knit in the round, were not perfect, but were so much better than the yoke that I really couldn’t pretend to myself that the yoke was fine. It was actually quite hard to get photos that fully show the problem – my camera appears to be amazingly forgiving! I also spent a ridiculous amount of time shifting yarn along the rows to try and even out the tension, so these pictures are already an improvement on the original state of my knitting. On the reverse side, the differently-sized gaps between rows are pretty clear to see. I think that I will use this yarn instead for a project that involves either lace or cables. It was a relief to stop working on this version of my cardigan. Once I switched to the Rowan Felted Tweed that I am using the whole project took on a much sunnier aspect. My tension is still not perfect, but this yarn is so much more forgiving that even I (my own worst critic) am happy with the results. I have had in my mind for some time now a cardigan that I want to knit. This cardigan has a wrap-around front and three-quarter length sleeves. 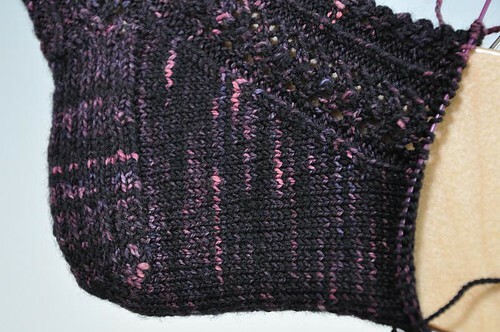 It is knit simply, in stocking stitch, but has a pretty picot edging all the way around. The cardigan has raglan sleeves, and is shaped to flatter and fit my shape. At the bottom, the back is slightly longer than the front so that the wraparound part sits smoothly on my waistline. The picot edging is crocheted to give a little stability to the body of the cardigan when it gets wrapped around. The ties at the back are a continuation of the crocheted picot edge. Having spent a long, long time trawling through patterns on Ravelry, I realised that the cardigan that I want to knit does not yet exist as a pattern. This one (Rav link) comes close, but it’s not, quite, right. So, I’m making up my own. 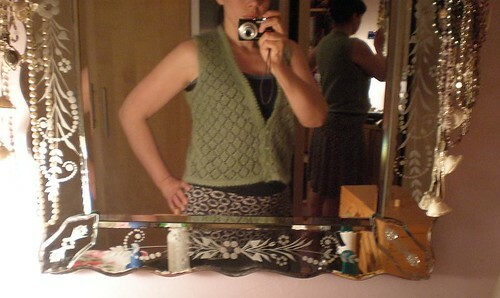 I am using Barbara Walker’s brilliant Knitting from the Top as the basis for this cardigan. The yarn is Rowan Felted Tweed, which is a seriously lovely wool/alapaca/viscose blend. This is my second choice of yarn – I had problems with my first choice which I will write about next time. On this version, I am almost down to my armpits, and am loving loving loving it so far!